A tap is used to cut the female portion of the mating pair (e.g., a nut). A die is used to cut the male portion of the mating pair (e.g., a screw). The process of cutting threads using a tap is called tapping, whereas the process using a die is called threading. Both tools can be used to clean up a thread, which is called chasing. Spiral Flute Taps Bottom, Plug and Modified Bottoming Taps. Available in Bright Finish, Hard Slick, Steam Oxide, TiN and TiCN Coatings. High Speed Steel, Powdered Metal , Vanadium And Tungsten Carbide Materials. The Right Tap for the most demanding applications at an affordable price. 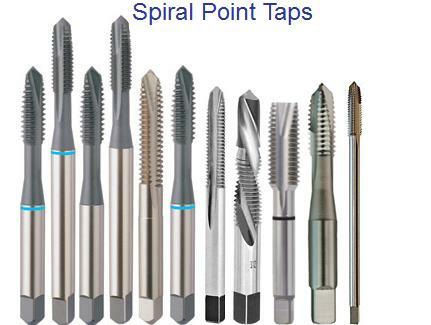 Spiral Point taps are designed for thru hole applications. The spiral point pushes the chips forward and out the bottom of the hole, this helps to eliminate torn threads in the work piece. 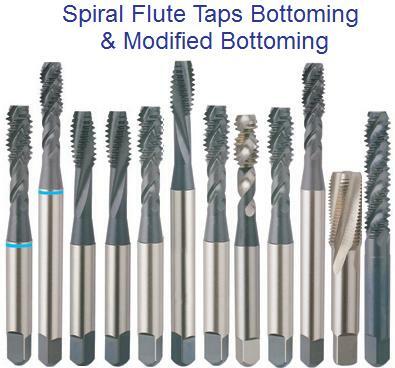 Spiral Point taps come in a wide variety of sizes including fractional, machine screw, and metric sizes; as well they come in optional numbers of flutes. 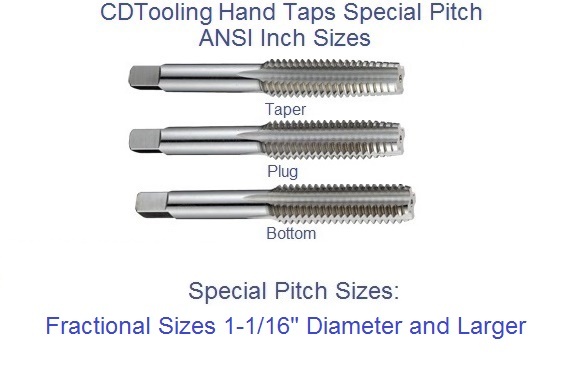 Acme taps have a 29 degree thread angle and the thread height is one half of the pitch. This style thread is common in lead screws and other load bearing applications. Used for producing traversing motions on machine tools and are extensively employed in the manufacture of valves, jacks and other mechanisms. 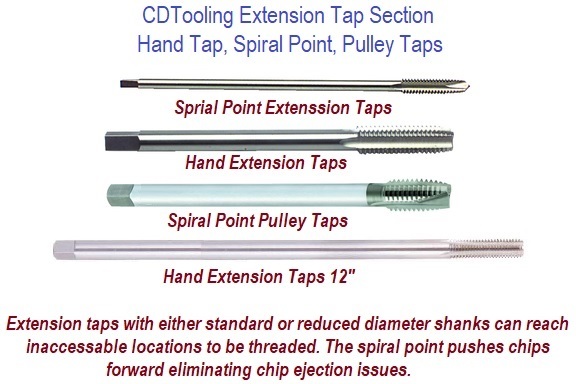 Extension Tap Section Hand Tap, Spiral Point, Pulley Taps extension taps with either standard or reduced diameter shanks can reach inaccessable locations to be threaded. The spiral point pushes chips forward eliminating chip ejection issues. Bottoming, plug and taper taps, from top to bottom, respectively. The tap illustrated in the top of the image has a continuous cutting edge with almost no taper between 1 and 1.5 threads of taper is typical. This feature enables a bottoming tap to cut threads to the bottom of a blind hole. A bottoming tap is usually used to cut threads in a hole that has already been partially threaded using one of the more tapered types of tap; the tapered end ("tap chamfer") of a bottoming tap is too short to successfully start into an unthreaded hole. In the US, they are commonly known as bottoming taps, but in Australia and Britain they are also known as plug taps. The tap illustrated in the middle of the image has tapered cutting edges, which assist in aligning and starting the tap into an untapped hole. The number of tapered threads typically ranges from 3 to 5. Plug taps are the most commonly used type of tap. In the US, they are commonly known as plug taps, whereas in Australia and Britain they are commonly known as second taps. The small tap illustrated at the bottom of the image is similar to a plug tap but has a more pronounced taper to the cutting edges. 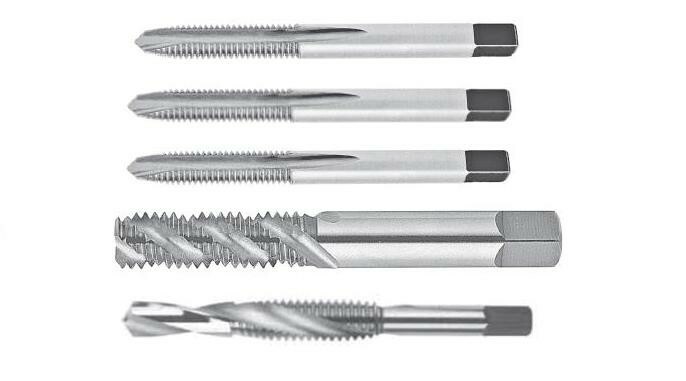 This feature gives the taper tap a very gradual cutting action that is less aggressive than that of the plug tap. The number of tapered threads typically ranges from 8 to 10. 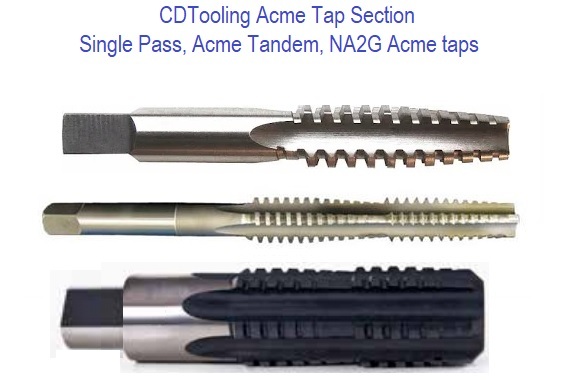 A taper tap is most often used when the material to be tapped is difficult to work (e.g., alloy steel) or the tap is of a very small diameter and thus prone to breakage. The above illustrated taps are generally referred to as hand taps, since they are, by design, intended to be manually operated. During operation, it is necessary with a hand tap to periodically reverse rotation to break the chip formed during the cutting process, thus preventing an effect called "crowding" that may cause breakage. Periodic reversing is usually not practical when power tapping is involved, and thus has led to the development of taps suitable for continuous rotation in the cutting direction. The most common type of power driven tap is the "spiral point" plug tap (also referred to as a "gun tap"), whose cutting edges are angularly displaced relative to the tap centerline. This feature causes the tap to continuously break the chip and eject it into the flutes, preventing crowding. Another version of the spiral point plug tap is the spiral flute tap, whose flutes resemble those of a twist drill. Spiral flute taps are widely used in high speed, automatic tapping operations due to their ability to work well in blind holes. Whether manual or automatic, the processing of tapping begins with forming and slightly countersinking a hole (usually by drilling) with a diameter somewhat smaller than the tap's diameter. The correct hole diameter may be determined by consulting a drill and tap size chart, a standard reference item found in many machine shops. If the hole is to be drilled, the proper diameter is called the tap drill size. where TD is the tap drill size, MD is the major diameter of the tap (e.g., ? inch for a ? "-16 tap), and N is the number of threads per inch (16 in the case of a ? "-16 tap). For a ? "-16 tap, the above formula would produce 5/16 as a result, which is the correct tap drill diameter for a ? "-16 tap. 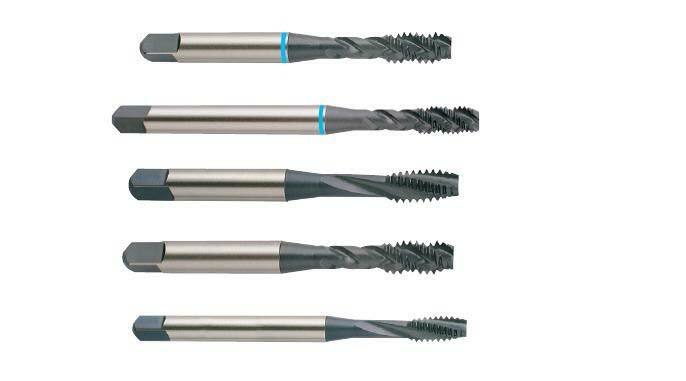 The result produces a tap drill size that results in an approximate 75 percent thread. 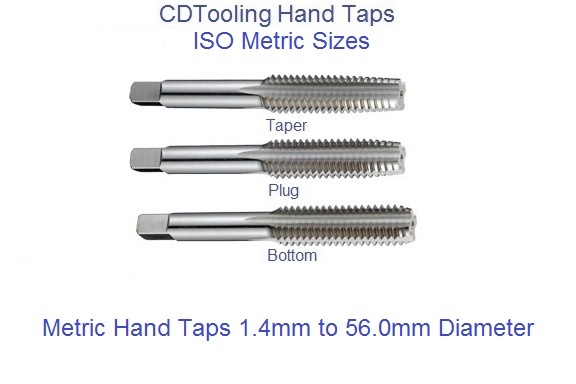 where TD is the tap drill size, MD is the major diameter of the tap (e.g., 10 mm for a M101.5 tap), and pitch is the pitch of the thread (1.5 mm in the case of a standard M10 tap) and so the correct drill size is 8.5 mm. This works for both fine and coarse pitches. With soft or average hardness materials, such as plastic, aluminum or mild steel, the common practice is to use an intermediate (plug) tap to cut the threads. If the threads are to extend to the bottom of a blind hole, the intermediate (plug) tap will be used to cut threads until the point of the tap reaches bottom, after which a bottoming tap will be used to finish the hole. Frequent ejection of the chips must be made in such an operation to avoid jamming and possibly breaking the tap. With hard materials, the machinist may start with a taper tap, whose less severe diameter transition reduces the amount of torque required to cut the threads. If threads are to be cut to the bottom of a blind hole, the taper tap will be followed by an intermediate (plug) tap and then a bottoming tap to finish the operation. Tapping may either be achieved by hand tapping by using a set of taps first tap, second tap & final (finish) tap or using a machine to do the tapping, such as a lathe, radial drilling machine, bench type drill machine, pillar type drill machine, vertical milling machines, HMCs, VMCs. Machine tapping is faster, and generally more accurate because human error is eliminated. Final tapping is achieved with single tap. Although in general machine tapping is more accurate, tapping operations have traditionally been very tricky to execute due to frequent tap breakage and inconsistent quality of tapping. Use of tap with improper tap geometry for a particular application. Use of non-standard or inferior quality taps. Mismatch of machine feed and tap feed may cause the tap to break in tension or compression. Use of improper cutting fluid or not enough fluid. No safety mechanism to limit torque below torque breakage value of tap. 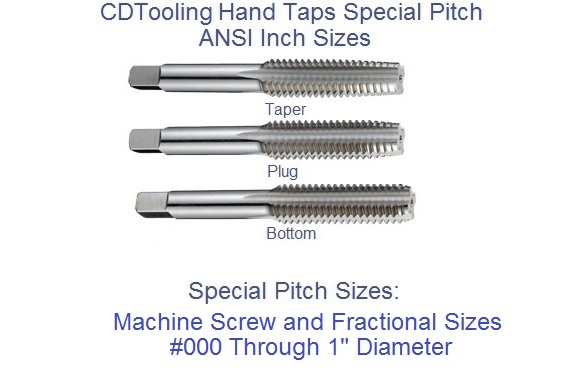 In order to overcome these problems, special tool holders are required to minimize the chances of tap breakage during tapping. 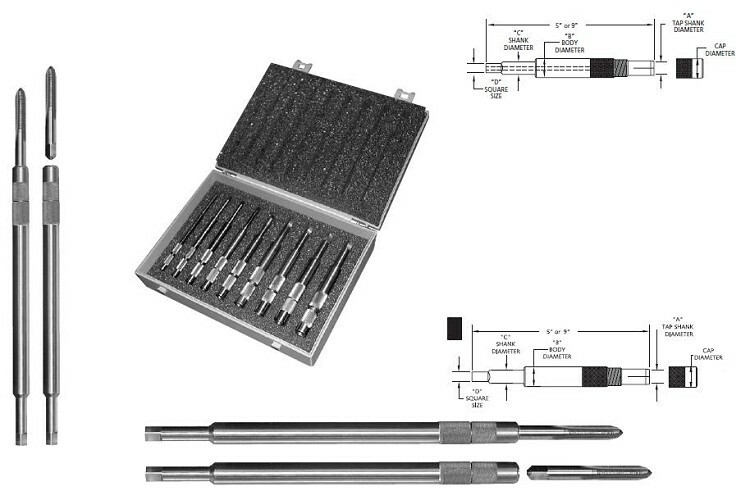 These are usually classified as conventional tool holders and CNC tool holders. 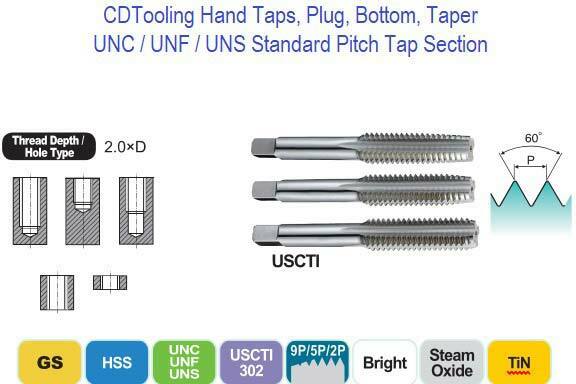 Taper Taps, Semi-Bottoming Taps, CNC Forming Taps, Metric Taps, Nut Taps, Short Projection Pipe Taps, Coolant Fed ( oil hole ) Taps, Taps for Non Metallics, Combination Taps and Drills, Combination Tap and Reamer, Piloted Taps, Shell Taps, Acme Taps, Pipe Taps, Plug Taps, Special Taps, High Performance Taps, Hand Taps Spiral Pointed Taps, Spiral Fluted Taps, Maintenance Taps, British Taps, Buttress Taps, Din Standard Tap, Form Taps, Miniature Taps, Tap and Die Sets.